After a long period of no income I finally got a gig that will pay the bills a bit. To celebrate this I splurged on getting my guitar intonated, setup and bought replacement EMG active pickups for it. At about the same time I was researching guitar processors in order to try to get a “BIG” sound without having the neighbors come up the driveway at midnight with torches and pitchforks. I first bought a new Korg PX5D which has a lot of benefits and is reviewed elsewhere. But certain lead tones I was hankering after I couldn’t achieve. So I spotted a used Line6 PODxt in a local guitar store. It was a little battered, had no power supply or manual, but the price was right so I bought it and tried it as well. Both units can send their audio outs directly to the computer using USB, which is a nice benefit. They also have patch editors/librarians which can be used over USB. But currently (2014) I am using the guitar/bass effects included in the Zoom R8 and am extremely happy with them. The Pandora has been sold and the Pod just gathers dust on the shelf. 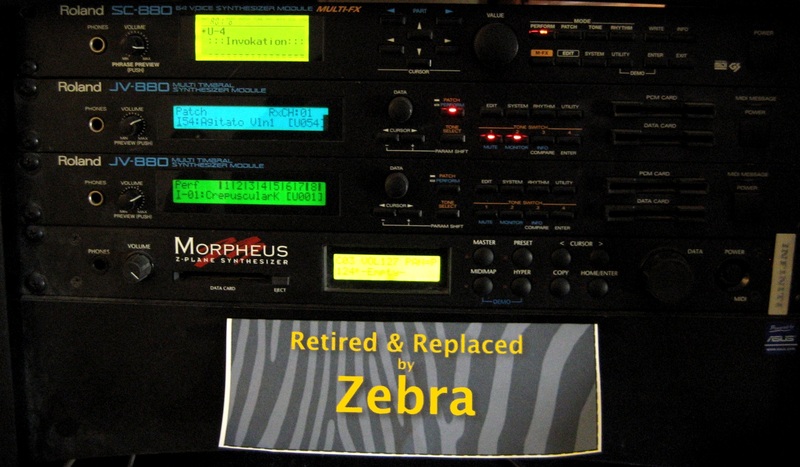 This was a very advanced and clever synthwhich was sold in the early 1990s. 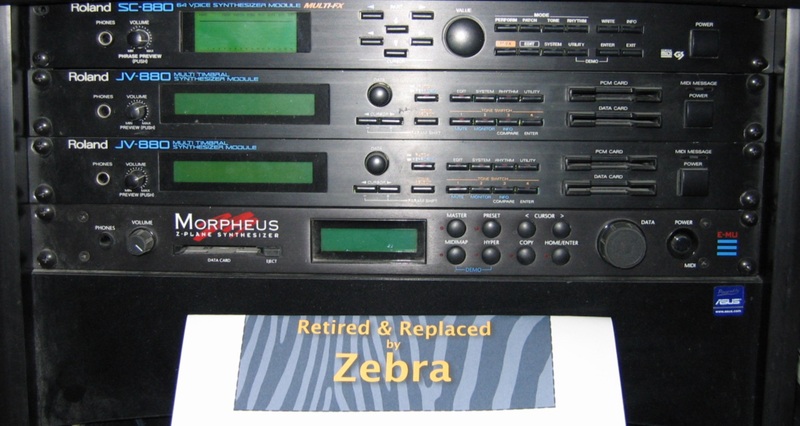 There is an excellent history and description page here: Morpheus Z-Plane synth. This was obviously copyrighted by E-mu, but unless I get a note objecting to making it available here, I’ll leave it up. Many was the hour I spent with these old warhorses. But with the calendar ever accelerating and the amount of time I have to spend tweaking sounds shrinking, soft synths are looking more and more attractive. One of my favorites is Zebra by Urs Heckmann. This quirky beast is a little strange to use but you can get fantastic sounds out of it. I’ve been using a free “LE” version of it for a long time that came with Computer Music magazine. I found myself always returning to it and started saving money to get the full version. I have to admit that in the cases I’ve turned on those old Roland boxes again, they seem to have a “presence”, depth and “punch” that I don’t seem to get out of the softsynths. Is it my imagination? Possibly.